Spidey joins the FF and faces both Fear Itself and Spider-Island! In AMAZING SPIDER-MAN #648, Spidey and his team fought both Dr. Octopus’ octobots and a new Sinister Six while Peter parker lost his apartment, but gained a new job at Horizon Labs. The Hood gained two Infinity Stones in AVENGERS #7, leading to the wallcrawler discovering the existence of the Illuminati in AVENGERS #8. He warned the Avengers of their responsibility to stop the Hood from gaining more Stones in AVENGERS #9, and flew off to Area 51 with Iron Man to pick up Stark’s own Infinity Stone in AVENGERS #10. After the Avengers’ ruse to stop the Hood using an image of Thanos in AVENGERS #11, Iron Man himself wielded the Infinity Gauntlet and the team stopped the Hood once and for all in AVENGERS #12. Later, Stark held a press conference to announce the rebuilding of fallen Asgard in AVENGERS #13. Phil Urich became the new Hobgoblin in AMAZING SPIDER-MAN #649 and attacked Horizon Labs on Peter’s first day there. Spidey created a new suit to render him invisible in AMAZING SPIDER-MAN #650, and teamed with Black cat to recover the reverbium Hobgoblin stole from Horizon for the Kingpin in AMAZING SPIDER-MAN #651. The Avengers investigated a Doombot in NEW AVENGERS #8, staked out former HAMMER agents and their boss Superia in NEW AVENGERS #9, and when Mockingbird went down with a gunshot wound, Spidey called an ambulance in NEW AVENGERS #10. While waiting on news of his partner at the emergency room in NEW AVENGERS #11, the webslinger wondered if Victoria hand set his team up for Superia’s attack, and subsequently helped defeat her in NEW AVENGERS #13. 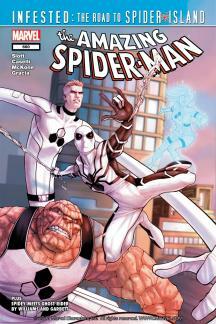 Alastair Smythe and the Spider-Slayers returned in AMAZING SPIDER-MAN #652, as well as Mac Gargan as the Scorpion. Spidey battled Gargan at the launch of John Jameson’s space shuttle in AMAZING SPIDER-MAN #653, but during the final clash between the wallcrawler and his enemies, J. Jonah Jameson’s wife Marla died as a result in AMAZING SPIDER-MAN #654. Following Marla’s funeral in AMAZING SPIDER-MAN #654.1, Spider-Man swore that no one else around him would die on his watch in AMAZING SPIDER-MAN #655. 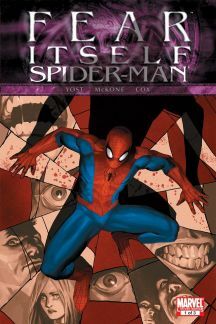 An intense battle with new violent villain Massacre in AMAZING SPIDER-MAN #656 moved Peter to fashion a suit of armor to help defeat him. The webslinger joined the Fantastic Four in remembering the fallen Johnny Storm in AMAZING SPIDER-MAN #657, and learned Johnny bequeathed him his spot on the famous team. 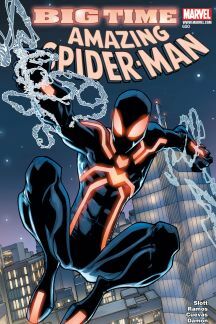 On his first mission with them in AMAZING SPIDER-MAN #658, he investigated several space-time rifts, fought the Sinister Six in AMAZING SPIDER-MAN #659, and helped close the rifts with Reed and the others in AMAZING SPIDER-MAN #660. In NEW AVENGERS #14, Spidey threatened to quit the group over his suspicions of Victoria Hand, but when the Red Skull’s daughter Sin began her vicious attacks on New York in NEW AVENGERS #15, he stood by their side in FEAR ITSELF #1 to face the coming of the Serpent, an ancient foe of Asgard’s Odin. 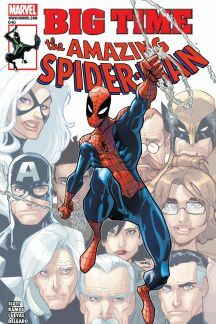 In FEAR ITSELF #2, Captain America dispatched Spidey and others to investigate strange mystical hammers fallen to Earth, and in NEW AVENGERS #16, the webslinger welcomed Daredevil onto the team to bolster their ranks during the crisis. While searching for his Aunt May in FEAR ITSELF: SPIDER-MAN #1, Spidey saved citizens from their own fears and encountered Vermin and his rats. In FEAR ITSELF: SPIDER-MAN #2, he witnessed the Thing pick up one of the mystical hammers and be transformed by it, and in FEAR ITSELF: SPIDER-MAN #3, he faced off against his friend, now called Angrir. Back with the Avengers in FEAR ITSELF #5, Captain America ordered him to stand down, which he did until he confirmed May’s safety in FEAR ITSELF #6 and headed back into the fray. In FEAR ITSELF #7, Spidey took up an Asgardian weapon forged by Tony Stark and fought to defeat Sin and her warriors, but she escaped in AVENGERS #17. With Earth’s Mightiest Heroes deciding who would fill the slots on a new team in AVENGERS #18, the webslinger stood in as a substitute teacher at Avengers Academy in AMAZING SPIDER-MAN #661 and he and his class took down Psycho-Man together in AMAZING SPIDER-MAN #662. Spidey fought Anti-Venom in AMAZING SPIDER-MAN #663 over the question of Mister Negative’s true identity, which stood revealed to our hero’s satisfaction in AMAZING SPIDER-MAN #664. Norman Osborn escaped prison in NEW AVENGERS #16.1, and sent a giant robot after the Avengers in NEW AVENGERS #17 while he began to rebuild Hydra from the remnants of its past lives. Peter searched for a mugger who assaulted Betty Brant in AMAZING SPIDER-MAN #665, but when New Yorkers started exhibiting powers identical to his own in AMAZING SPIDER-MAN #666 he turned to address the mayor’s lockdown of the city in AMAZING SPIDER-MAN #667. Total chaos erupted on the island in AMAZING SPIDER-MAN #668 while Spidey and other heroes looked frantically for a cure to the weird spider virus. 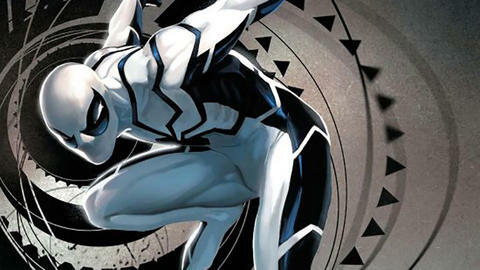 Anti-Venom believed he held the key to a cure in AMAZING SPIDER-MAN #669 as the Adriana Soria, known as the Queen, revealed herself as the virus’ source. Mayor Jameson and other mutated into human spiders in AMAZING SPIDER-MAN #670, and when Mary Jane Watson gained spider powers she swung off to help Spidey fight back to hordes. Reed Richards developed a real cure in AMAZING SPIDER-MAN #671, but as the real webslinger pushed through a gauntlet of foes, the Queen grew stronger. Finally, after Ariana mutated into a giant spider in AMAZING SPIDER-MAN #672, our hero and his clone Kaine brought about her crushing defeat.